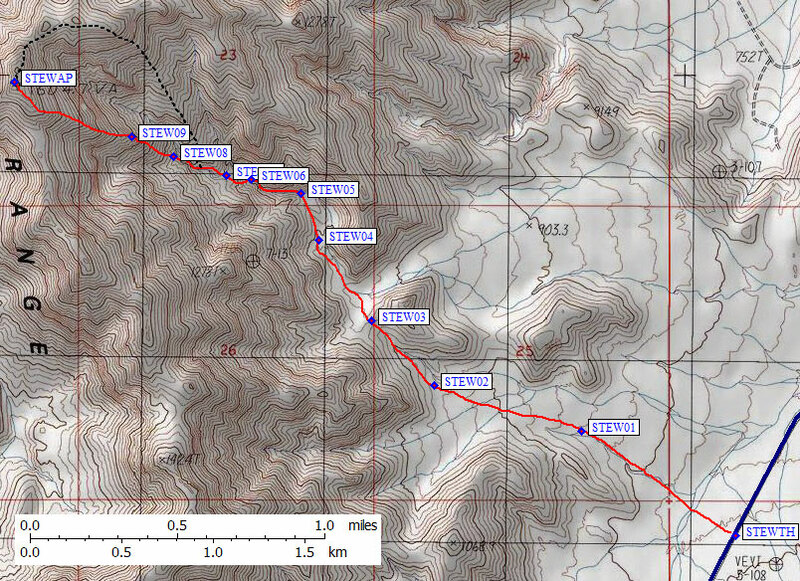 Waypoints and area maps are on the trailhead page. The trailhead for Eagle is where a road apparently used to cross the Amargosa River. There are plenty of trip reports mentioning the need to wade this river, but on Thanksgiving Day it was bone dry and fun for the kids to play in. There's a big concrete pad on the far side that hints there was once a bridge or tram here. The trailhead area is a great place to camp, far enough from the highway but no high clearance required. We crossed the river and strolled up the open desert slope to the base of this striking peak. There were clouds at dawn, but we weren't worried. The night before (grilled turkey and yams) had been picture perfect with a big moon and no wind. Cold, but nice. The DPS GUide talks about three chutes, but it wasn't clear to me which three! I think they mean the three chutes within one bowl, which come together as they drop to the top of an alluvial fan. From the base of the bowl (waypoint EAGLE1) we stayed left of the chutes' confluence, and found a use trail. Some ledges made the climbing fun, which was important since this was the first time I had taken the kids (8 and 12) on a real peak (e.g. one without a trail). The next landmark was supposed to be a white rock band, but there are several of these. 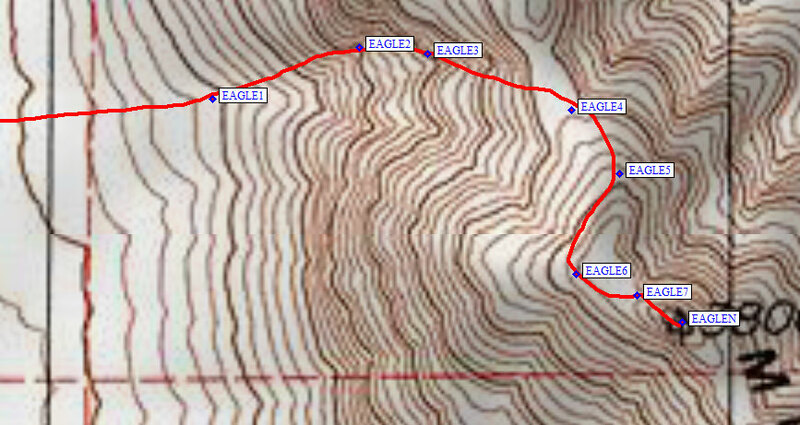 The first one at 2800' (waypoint EAGLE2) fooled us, in concert with some ducks, into traversing right. (Rock band? Concert with ducks?) Soon we traversed back left. Just stay left until you hit a headwall and HAVE TO go right... this white band at 3000' (waypoint EAGLE3) can be seen all the way from the cars, and popping over the edge of it feels a bit exposed to beginners. 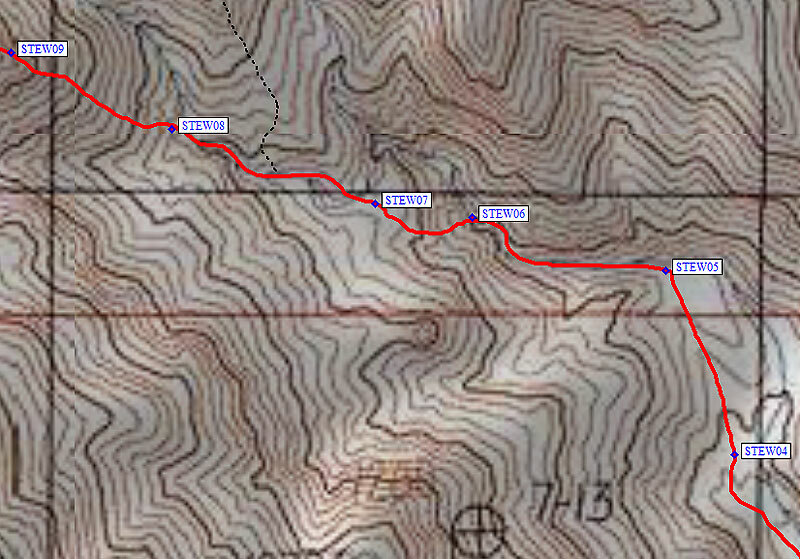 Above the white band, we angled right (south) and up to the saddle (waypoint EAGLE4) at 3400'. This part of the climb feels more like a steep face than a chute. The DPS Guide seems to say you should drift right and not cross this saddle, but there is a good use trail on the east side of the ridge and the best place to get on that trail is at this saddle. Follow the use trail up several hundred feet elevation, where it switches back to the east side of the ridge (waypoint EAGLE5). The use trail skirts under cliffs, rounding a corner (waypoint EAGLE6) before heading to the ridge just below the final summit block (waypoint EAGLE7). It's only 100 yards horizontal from here to the summit, but the wind was really gusting and the ridge is a knife edge so I scampered to the summit and back while Stella and the kids tried to find a windbreak. They did great for their first climb, but our tent got flattened by the wind while we were out. The casinos of Pahrump always have excess capacity so the day ended with a shower instead of a sand-filled tent. I didn't park where the DPS Guide says to, because I wanted the shortest possible walk and I wanted to park well off the pavement. There are many erosion control berms in this area that can be parked on, and we picked the one at waypoint STEWTH. I left the car, family in tow, by 7am. It's best to walk between or beside the washes, rather than making a beeline for the first saddle as the DPS Guide suggests. Waypoints STEW01 and STEW02 are waypoints that will speed up the walk across the desert. 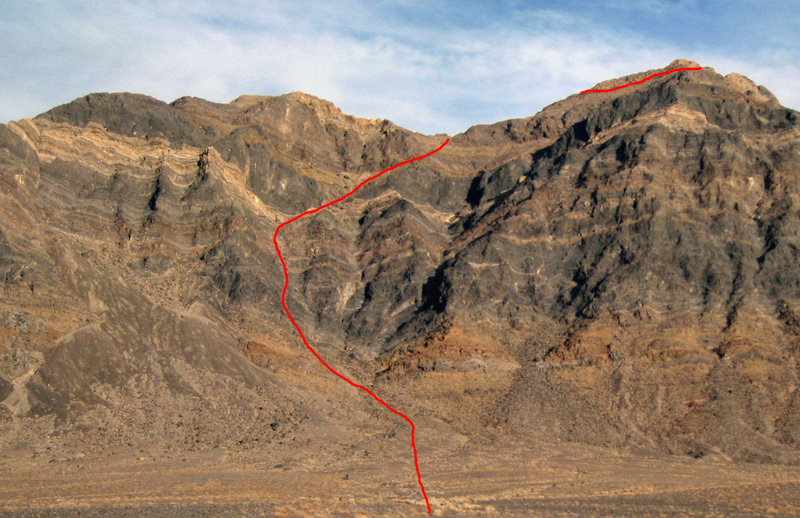 The southwest side of the wash is far better footing when approaching the saddle visible from the road (waypoint STEW03). After the first saddle (waypoint STEW03) drop 50' into a different drainage but continue heading northwest. This wide gravel wash has a rising black ramp on the right (east) side. The ramp eventually forms a blockage where the drainage splits at 3200'. Shortcut the main wash by staying left in a dry draw from waypoint STEW04 to STEW05. The draw ends at a small saddle (waypoint STEW05) where you drop 30' back into the main drainage. Turn left (west) and watch for a large dry waterfall set back from the left (south) of the canyon. Just after that, scramble up onto a use trail on the left to avoid several small waterfalls. The canyon turns right and then left and hits a third, larger, waterfall at 3450'. Enjoy the rock here but climb out the right (northeast) side of the canyon about 20' before the large waterfall. Above here the main canyon is black rock with many converging drainages, causing slots and waterfalls. Bypass all the black rock canyon problems by climbing around the large waterfall on the right, and IMMEDIATELY crossing to the left side of the drainage just above the waterfall (waypoint STEW06). 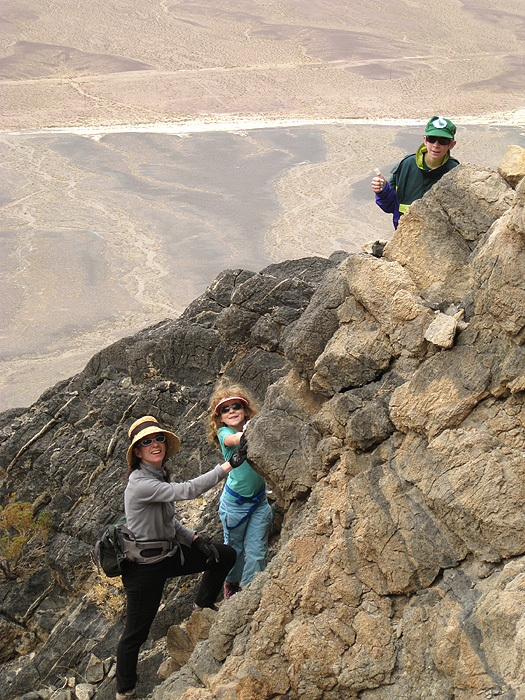 Climb the open slope on the left (west) side of the wash. There are many ducks in this area! Most of them are BAD! There are ledges and cacti on the open slope, and staying to the left side of the slope seemed easier. Near the top of the slope, bear right around a corner into a small drainage. Follow that drainage northwest up to white-rock saddle at 3650' (STEW07). The climb to the white saddle is more like 200' than 80', and doesn't seem to match the DPS Guide. But it works well! From the saddle (STEW07) drop 30' NW into the left fork of the drainage having cut the corner AGAIN. This puts you in the leftmost drainage of all the canyons that merge here. Climb NW in this drainage until it turns into a narrow baserock slot and snakes its way (class 2-3) above the black rock layer. Watch for a waterfall on the left and an overhang on the right where the canyon turns sharply right (north) at 3800'. Opposite the overhang (waypoint STEW08), climb a gray ramp up and left out of the canyon. The peak is behind the black outcropping visible from the top of the ramp. Follow the ridge through (not around) the black outcropping at 4250' (waypoint STEW09). It looks bad but goes easily if you stay within a few yards of the ridge. I left my family in the slot canyon and raced to the top (waypoint STEWAP), arriving before 11am. Stewart's high point is white rock, with a transition to black rock on the right (northeast) side. From the road this bump doesn't seem to be the highest one. We got back to car just after 2pm. There were rain showers all around but we never got wet.